“Music in the past, building skills in the present” is a new venture for Echoing Air and Henry Leck. The purpose of this series is to provide music educators and students arrangements of early repertoire that pursue vocal and musical excellence while placing the music in an historical perspective. 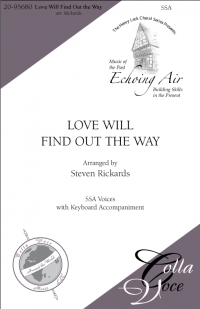 Echoing Air, Inc. was founded in 2009 as a 501(c)(3) nonprofit ensemble dedicated to the exploration of and advocacy for music that features the pairing of 2 countertenor voices with 2 recorders and basso continuo. The name “Echoing Air” reflects the aspects of pairings of voices in duets and imitation, and is a quote from a famous song by Henry Purcell, who was perhaps the greatest English Baroque composer, “Hark, the Echoing Air”. Since its inception, the ensemble has undertaken many tours of the United States, including performances in Florida, Georgia, South Carolina, Alabama, Tennessee, Indiana, Michigan, Ohio, Illinois, Missouri, Nebraska, and Arizona. Echoing Air has a fervent commitment to education. Ensemble members are all educators with a passion for working with students. Particularly in the present day where music is so often being cut from budgets, Echoing Air enjoys bringing our joy for what we do into the schools from preschool through graduate school. Dr. Rickards also expanded the ensemble’s outreach and community presence by inviting selected local teen singers to participate in the Echoing Air Vocal Ensemble in a project of collaboration with the Peabody Consort in the Indianapolis Early Music Festival of 2017. As an ensemble, we are ambassadors for our art, instruments, and music, opening doors of new experience and understanding to the audience and performers of tomorrow.